When planning your holiday to Scotland, you will be able to find an infinite amount of information from travel guides, magazine articles, recommendations and opinions on the internet. The internet is indeed awash with photos from all over Scotland showing some of the stunning locations that you can visit, and understandably travellers would love to see as many of these locations during their holiday. The desire to see the ‘whole of Scotland’ is a common theme. It looks small on a map, which means I can see it all – right ? We are often asked for our views on travel plans that people are pulling together for Scotland, so here are some of our views to help you. Travelling around the Highlands does take a long time, especially as you head further North where the roads are narrow, twisty and often single track. Travel times are much longer than you may expect. 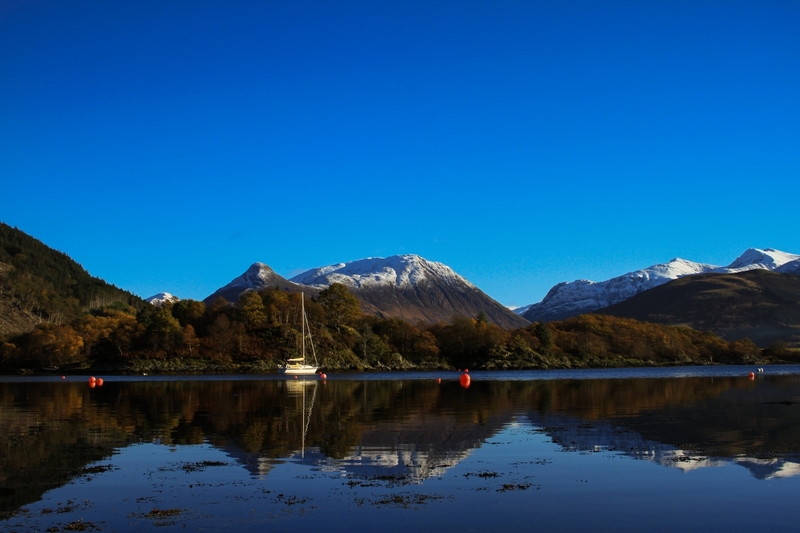 If you traditionally like a touring holiday, then in Scotland you may spend a much greater part of your valuable holiday time driving from one destination to the next than you may expect. If I were to travel to America for a couple of weeks, and try to go to New York, Washington, Las Vegas, San Francisco, Arizona, Los Angeles, Grand Canyon, Yellowstone, Utah, California then people would rightly say we were mad. In fact I have friends who have made such a hectic tour and whilst they have some nice photos of the key sights, they also bemoan the fact that 50% of their entire holiday was spent travelling from one destination to another. All great if you like a holiday living in an airport !!! Spending a week or two trying to explore a whole country seems to be on the agenda of many people, but personally, I would rather soak in the culture of a country in a smaller number of places rather than spend each day travelling to a new destination and hour upon hour looking at the inside of your car, which can be a particular disappointment for the driver. Many of the stunning photos and destinations you see and want to visit will also be on the hit list of many other travellers. These honeypot sites appear in every country you visit, and Scotland is no exception. Having spoken with many of our guests in recent years, this can lead to a bit of a disappointment. 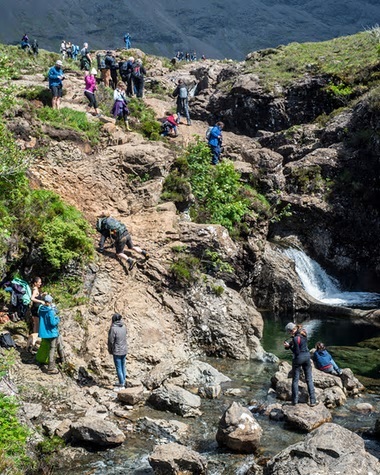 Take for example this photo of a typical day at the Fairy Pools – a honeypot site on the Isle of Skye. Whilst some people may find the crowds not too bad, others will be wishing for a more remote Highland experience. Don’t get me wrong, the Fairy Pools in Skye is a nice place, but it has been marketed extensively over recent years, so much so that it is no longer a quiet idyllic gem. What was once a tiny footpath alongside the stream heading up the glen is now a paved highway of tourists all looking for the same Instagram photo to share with the world. The irony is that in virtually every glen in Scotland, you will also find equally impressive waterfalls, and bathing pools that match the beauty of the ones in Skye, with one big difference – you’ll probably have them to yourself. So that then begs the question of what you want to get out of your Scotland holiday. What do you really want to see and explore. Do you want to avoid the crowds? All the areas of Scotland, be that the Western Highlands, the North West Highlands, the Islands of the Hebrides themselves, the Cairngorms, are microcosms of what Scotland is all about. You don’t need to visit them all to get your Highland experience, as a visit to just a single area is all you need to feel you’ve had a great Scottish holiday. What is it that makes a great holiday – well that is for you to determine, but we would certainly encourage you to visit and dwell longer in less congested areas. Scotland is a country rich in history and culture, and to immerse yourself in that culture for a while is where you will be rewarded with a true Highland experience. Treat your holiday as a slow adventure and try not to spend most of your precious holiday time behind the wheel of a hire car. Ask the locals about the wilder and unspoilt areas – they are everywhere. Avoid the honeypot sites, where there is an overconcentration of visitors. Immerse yourself in wild places and engage with local people, stories and food. Enjoy and experience the outdoors at a slower pace. Such a slow adventure experience is the perfect antidote to peoples frenetic urban lives. Do you not have enough haste in your lives? A holiday is about the memories and experiences you cherish when you explore an environment and culture different to your normal day to day lives. It’s about doing something new and fresh to invigorate you after working hard all year. You spend enough time commuting in traffic on a daily basis – why spend your holiday frantically driving through a whole country. Slow down, stay a while, learn something new. Let stories not selfies narrate your experience of the Scottish Highlands. But whatever you do, we are sure that any holiday you have in Scotland will be a great one.